Donizetti's opera proves the adage that hell hath no fury like a woman scorned – and that woman is particularly dangerous when she's Queen Elizabeth I. Also believing that one shouldn't let the truth get in the way of a good story, Donizetti massively embroidered the rumoured love affair between the Virgin Queen and Robert Devereux, Earl of Essex, to create a love quartet which leads to destruction. Elizabeth is in love with Devereux and has sent him to Ireland to keep him out of her way. In the meantime, he has been charged with treason and is brought back to face the death penalty. Elizabeth holds his life in her hands but she fears he has fallen in love with another woman. That other woman is Sara, wife of his friend the Duke of Nottingham. When Elizabeth discovers proof Devereux does love another she signs his death warrant but then goes mad with remorse. In this Welsh National Opera production at Birmingham Hippodrome, Joyce El-Khoury is a towering presence as Elizabeth. She is both sovereign and woman and, as the story unfolds, she gradually loses grip on her rule and on her own sanity. Initially dressed in striking red with her trademark wig, by the close of the story, she is bareheaded and almost bare-chested as she raves around the stage. Her love rival Sara, Justina Gringyte, is where our sympathies lie. Here is a woman trapped in a loveless marriage who would do anything for Devereux and fights to the end to save him. Roland Wood is her husband, who, when he realises his wife's affections lie elsewhere, turns on his friend and supports his death sentence. Barry Banks is the hapless Devereux, caught in the political machinations and plots he has no control over and unable to return the love of the queen. Directed by Alessandro Talevi and designed by Madeleine Boyd, the production is a revival from 2013 when it was performed as part of Donizetti's Tudor trilogy alongside Anna Bolena and Maria Stuarda. It uses the symbolism of a spider to underpin Elizabeth's power so in the opening scene we see the queen feeding cockroaches to a pet spider and when Devereux is in prison he is tied in a web-like structure from which we realise there is no escape. At times the imagery is overplayed – such as when Elizabeth appears in spider-shaped chariot which wheels around her as she sits malevolent at its centre. 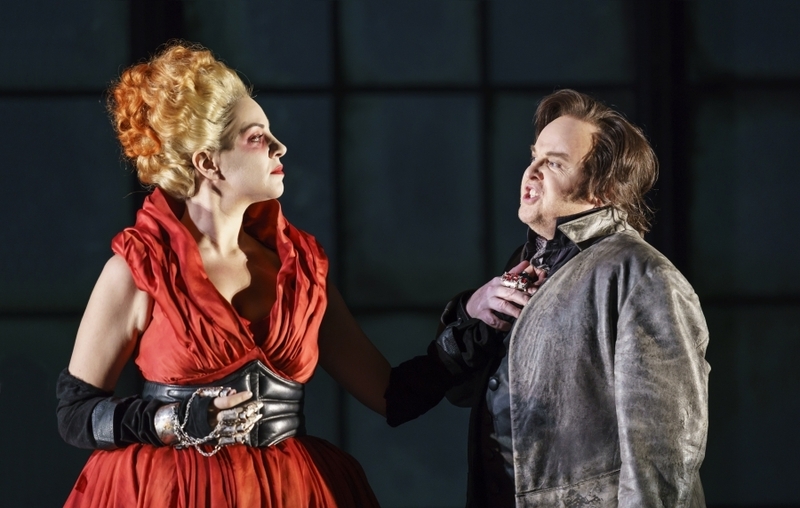 The huge metallic monstrosity emphasises her ruthlessness but it also dehumanises her and ultimately Roberto Devereux is a story of very real human emotions. Decisions are ruled by love, fury, jealousy and remorse – emotions felt not just by royalty. Whatever one makes of Donizetti's story there is little disputing his masterful control of music and the Orchestra of WNO, conducted by Carlo Rizzi, revels in its drama and its intricacies. Roberto Devereux is performed at Birmingham Hippodrome alongside Un ballo in maschera and The Magic Flute until Sat 9 March and then tours to Milton Keynes, Plymouth, Bristol, Llandudno and Southampton.